Lilling might seem like an idyllic English village, but it’s home to a dark history. In 1976, a teenage girl named Annalise Wood disappeared, and though her body was later discovered, the culprit was never found. Decades later, Annalise maintains a perverse kind of celebrity, and is still the focus of grief, speculation, and for one young woman, a disturbing, escalating jealousy. When DNA linked to the Annalise murder unexpectedly surfaces, cold case detective Morris Keene and his former partner, Chloe Frohmann, hope to finally bring closure to this traumatized community. But the new evidence instead undoes the case's only certainty: the buried body that had long ago been confidently identified as Annalise may be someone else entirely, and instead of answers, the investigators face only new puzzles. Whose body was unearthed all those years ago, and what happened to the real Annalise? Is someone interfering with the investigation? And is there a link to a present-day drowning with eerie connections? With piercing insight and shocking twists, Emily Winslow explores the dark side of sensationalized crime in this haunting psychological thriller. Emily, tell us about your series. Is this book a standalone, or do readers need to read the series in order? My four crime novels are a series set in Cambridge, England. The same detectives are in all of them, and there's an overall story arc in their personal lives, but each mystery stands alone. Genuinely, you can start with any one of them. I usually tell people: The Whole World is about a missing graduate student, two American undergrads with a crush on him, and a blind professor obsessed with her mother. The Start of Everything is about big-bang scientists at the Institute of Astronomy, an unidentified body found in the fens, and an autistic young woman determined to deliver a misaddressed letter. The Red House is about music, memory, and an engaged couple who might actually be brother and sister. 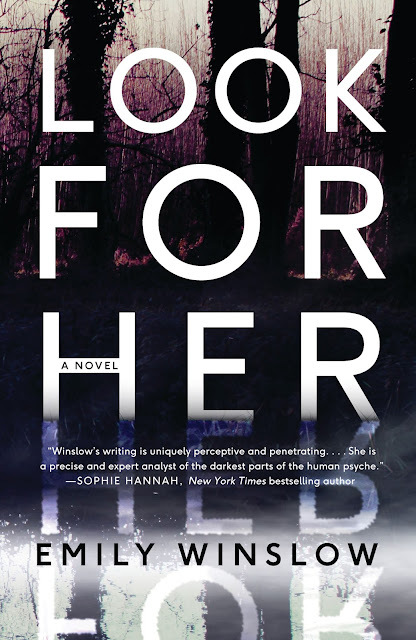 Look for Her is about a cold case investigation of a famous missing teenager, and a young woman in the present who is jealous of the famous victim. If you read them in that order, you follow the main detective's injury and subsequent struggles on the job. But you can also just start with whichever one draws you the most. I grew up in Maplewood, New Jersey, an idyllic New York City commuter town. We had the stimulation and culture of nearby New York, and the quietness, charm, and green spaces of a gentle suburb. I was very lucky to live there. Where is your favorite library, and what do you love about it? The children's room of my hometown library had a life-sized stuffed toy lion to climb on, a detailed doll house, and even a secret room behind a bookshelf-door for storytime! And we had the best children's librarian in the world (Pam Gosner), and really creative summer programs. That setting was a perfect introduction to the magic of books. What is the most daring thing you've done? I was convinced I wanted to be an actress when I was young, to the point that I studied at a non-academic conservatory for college. After four years there doing nothing but acting, I wanted out, but I felt embarrassed to stop. The rest of my class were headed to New York and Los Angeles with excitement. Changing my career aspirations felt humiliating, even shameful, as if I were admitting I couldn't handle it (which may have also been true) instead of that I didn't want it anymore. I wanted to write and went to grad school instead. Looking back now, it was absolutely the right decision, but at the time it felt like an enormous leap of faith. My best friend had a semester abroad at Cambridge. She met a great guy and spent the next five years trying to set us up (which took that long because we lived on different continents). Once she finally got us in the same room together, we hit it off and married eight months later. That was twenty years ago. What do you love about where you live now? Cambridge, England is exactly what dreamy Americans who have never actually been to England imagine it to be. The architecture is sublime. Art and music are everywhere, often free. It's a 50/50 chance that anyone you bump into will be a world-class expert in some arcane subject. This is where I live and where I set my books. The city is an inspiration. I try to be pretty careful about this. My novels are set in and around real Cambridge colleges. When the characters are just “students” or “fellows” I'm in the clear, but more specific roles (like “chaplain” or “Director of Music”) clearly indicate real people (which happened mostly in my book The Red House). I always get permission, even if I'm not using their names. Usually people are delighted to be part of a story. Is your book based on real events? This novel isn't, but the book I wrote immediately before it is. Jane Doe January is my memoir of involvement in a real-life court case. It was harrowing. I find it really stressful to cook for people. I'm just not confident in the kitchen. But my husband is a terrific cook and actually enjoys it, so when we throw dinner parties I do the inviting, the cleaning, the setting up. He makes something wonderful. We're a good team. My husband and I homeschool, so that takes a lot of our time and attention. We swap: I get to write in the mornings while he teaches our son, then he works in the afternoons. I've also started teaching creative writing at Cambridge's Institute of Continuing Education, which is wonderful. The classes are held in a gorgeous mansion just outside the city. The students are adults of all ages, and really want to be there. It's a pleasure. My top priority for writing time is to be completely alone. Sometimes I write in a guest room, if it's empty, or I hide away in our bedroom if the house is full. I also prefer a stretch of several hours. So, whenever I know the kids are occupied or otherwise looked after is the right time! A recent reviewer called this new book “beguiling.” What a lovely adjective! How did you find your publisher, and how long did your query process take? I queried agents for a few months before I signed with my wonderful agent Cameron McClure at Donald Maass. This was through an ordinary query letter; no “who you know” or secret handshake involved. She got me my first book deal a few months later. It's been wonderful being with Random House, HarperCollins, and Allison & Busby. I love working with such talented editors, designers, marketers. Their support means a lot. My mother picked the name Annalise for me because of a girl who was killed. Her name was Annalise Wood, and she went missing when she was sixteen. My mother was the same age when it happened. Annalise was lovely, much prettier than my sister and I ever became. She was the kind of girl you look at and think, "Of course someone would want to take her." Don’t look at me like that. I know that what happened to her was awful. It just seems a very fine line between being the kind of person that others want to be with and be like and treat well, and being the kind of person that some others, just a few, sick others, want to take for themselves. That’s the same kind of person, isn’t it? The loved and lovely. Isn’t that from a poem somewhere? That’s what she was like. That’s the risk when you’re the kind of person who’s wanted. Good people want to be close to you, but the bad people want you too. There were two photos of her that the media used most: her most recent school portrait, and a snapshot of her laughing, with the friends on either side cropped out. Taken together, they presented the two sides of a beautiful and perfect person: poised and thoughtful, and spontaneous and bubbly. The kind of person who deserves help and attention. Realistically, if they wanted these pictures to help strangers identify her if they saw her out and about with the bad man, they should have used photos of her frowning or looking frightened. Either there weren’t any (which may well be the case; who would take a photo of that? ), or they couldn’t bring themselves to advertise a version of her that was less than appealing. The narrative is important. If you want the “general public” to get worked up, you have to persuade. Attractiveness and innocence must be communicated, even if emphasising those traits makes the real person harder to recognise. In the end, she was already dead, so it’s a good thing, I suppose, that they used the nice photos. They’re the images that everyone remembers. My mum was a teenager when those pictures were in the paper every day for weeks, then weekly for months. Annalise Wood was the most beautiful girl in the world. Everyone cared about her. It’s what any mother would wish for her child, to be the kind of person that everyone would care about and miss if she disappeared. It wasn’t until Mum was over thirty that what really happened to Annalise Wood was discovered. 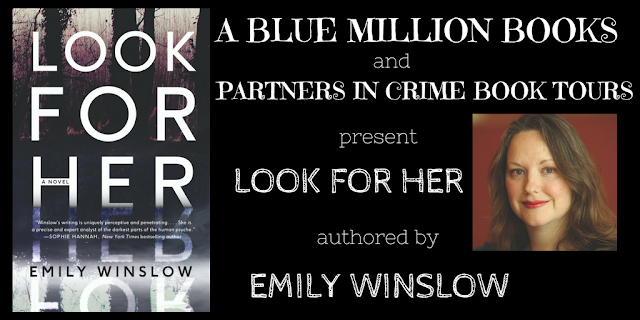 Excerpt from Look for Her by Emily Winslow. Copyright © 2018 by Emily Winslow. Reprinted by permission of William Morrow, an imprint of HarperCollins Publishers. All rights reserved. Emily Winslow is an American living in Cambridge, England. She trained as an actor at Carnegie Mellon University’s prestigious drama conservatory and earned a master’s degree in museum studies from Seton Hall University. 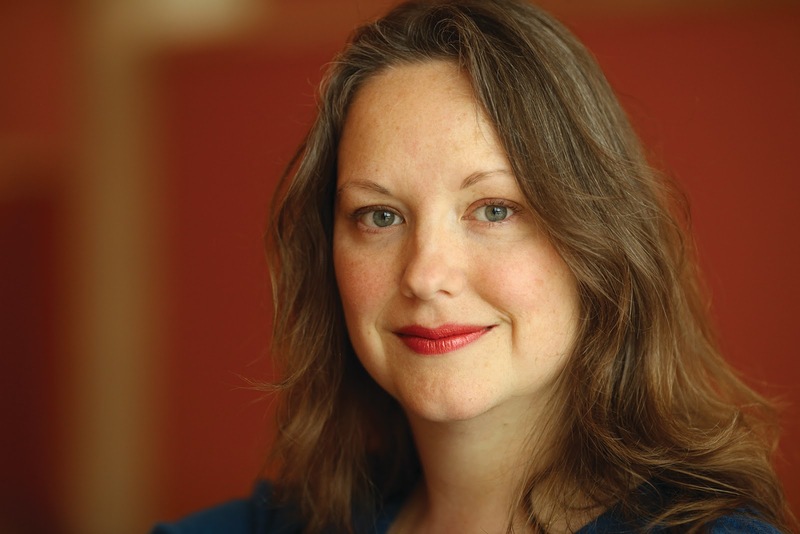 For six years she wrote for Games magazine, creating increasingly elaborate and lavishly illustrated logic puzzles. She lives with her husband and two sons. She is the author of four novels and a memoir.